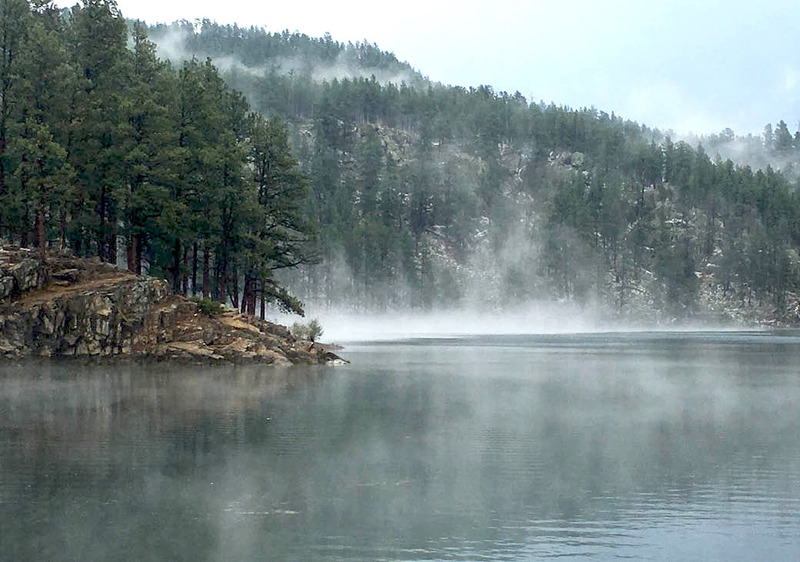 In early September I was on day three of an eight-day solo, self supported bikepacking trip in the Black Hills. 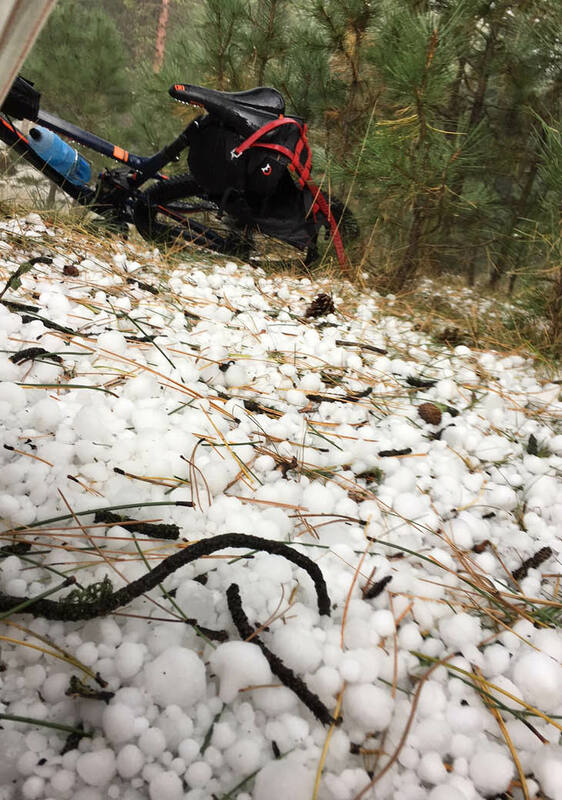 That morning I broke camp early knowing that I had to ride 24 tough and predominantly singletrack miles to the next destination before a potential late-afternoon thunderstorm. According to the weather forecast, the probability was 80% by 2:30 P.M. The day started out dry and hot without a cloud in the sky. For several miles it was ﬁrst and second gear terrain with switchbacks that did not seem to end. I was hot, and it was getting hotter. I came to the ﬁrst signiﬁcant downhill of the day distinctly recalling the advice of a friend: “It is ok to walk down if you feel it is too risky.” Between the rocks, steepness, and being solo with 26 pounds of gear on the bike, I decided to heed his advice. There were also a few ascents I pushed my bike for the same reasons. At this point, the day was challenging, beautiful, but uneventful. The ﬁnal ascent climbed into the Empress Gulch–a gorgeous, grassy and steady 900-foot descent to Lake Pactola. 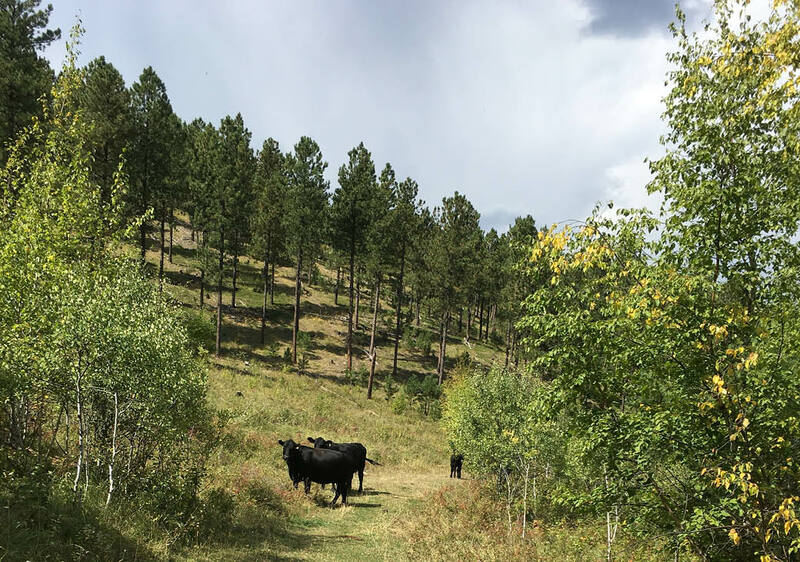 Towards the end of the 3-mile descent, I happened upon a small herd of free-range cattle that, after some gentle coaxing, reluctantly stepped aside to make way for the ﬁnal 500 yards that day. It now seemed as though I would beat the pending storm even as storm clouds gathered and thunder rumbled in the not-too-distant north. I quickly admired the beauty of the lake and the surrounding shoreline, but just as quickly surveyed the area for a place to pitch my tent. The skies darkened rapidly and the thunder became increasingly pronounced as I raced to set up. Just inside with my gear, the rain began. Pleased with my timing and comforted by the shelter, I relaxed a bit but only shortly. The skies seriously opened up and the rain turned to pea-sized hail. 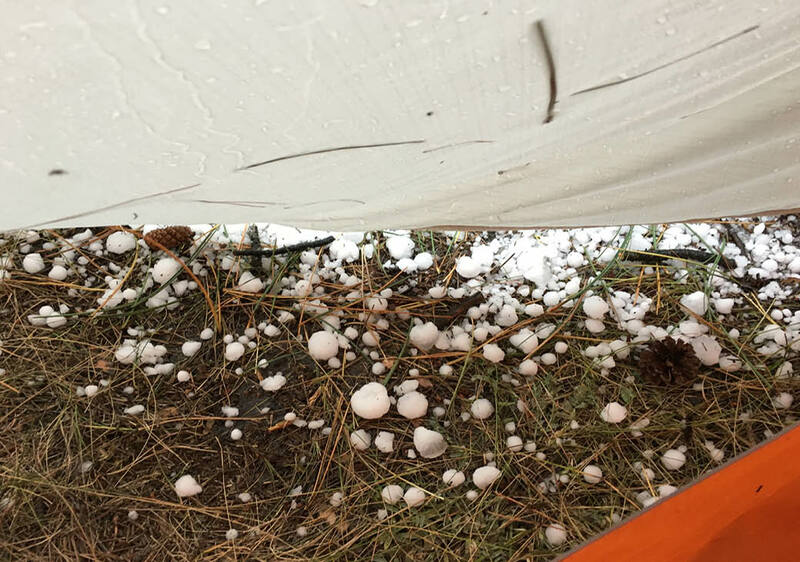 This was somewhat concerning, but as the sound of the hail beating on the tent intensiﬁed, it turned alarming. Peering out under the rainﬂy, I could now see ping-pong ball sized hail with some even larger. Knowing that if the rainﬂy ruptured, not only would my trip be signiﬁcantly compromised–but worse–I feared for my situation. Not wanting to be a sitting duck, I scurried to don my bike helmet and rain jacket and began to inﬂate my sleeping pad for cover. The pummeling lasted a full 19 minutes and gratefully my Big Agnes Copper Spur HV did not suﬀer a single rip, tear, leak, break, or compromise of any kind….period. 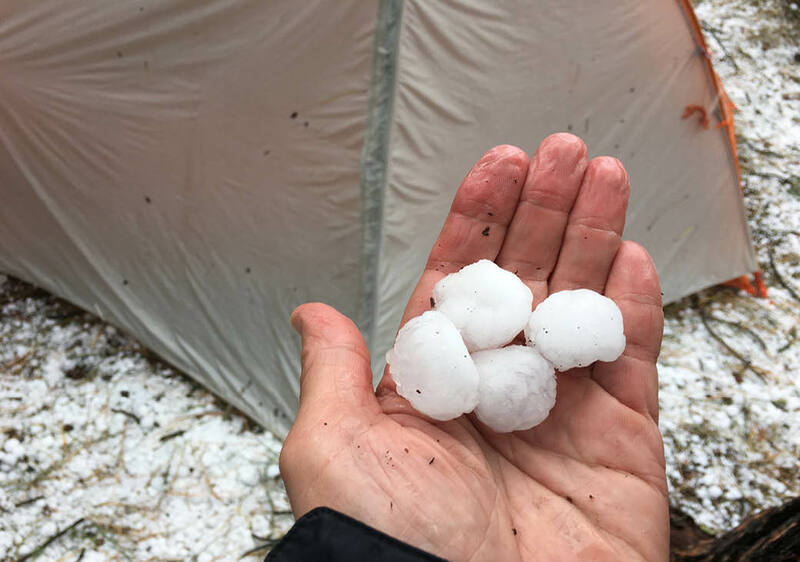 To shed some light on the power and movement occurring inside the tent during this barrage, the force of the hail shut the roof vent, my Garmin was vibrated out of the roof pockets, and Ponderosa pines all around took a signiﬁcant haircut. When the storm passed, I climbed out feeling lucky and rewarded having just witnessed the awesome power and now beauty of Mother Nature. 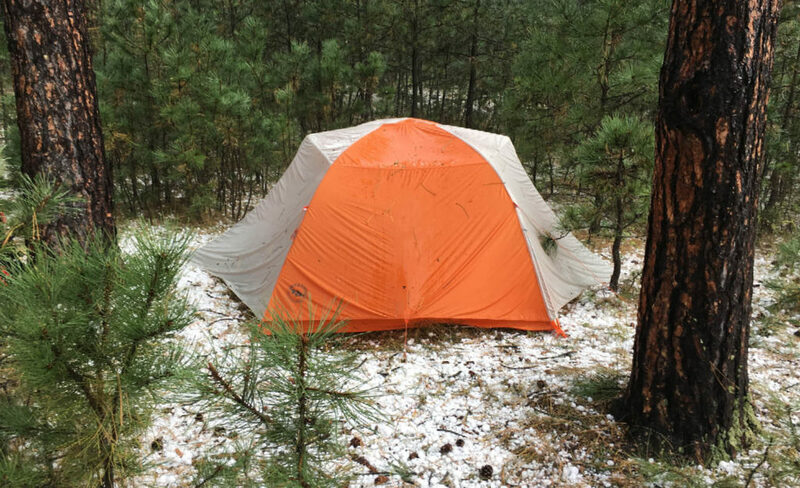 As a reader and even to my closest friends, it is hard to describe the tremendous respect I gained for the quality of this magniﬁcently light and durable tent. I am extremely grateful and forever loyal! Thanks to all at Big Agnes for your dedication and commitment to making the best. Wow, this is a great article about adventure and the importance of great equipment. Nice work! Wow! Awesome story and review! This gives me even more confidence in my newly purchased copper spur 2 expedition. Thanks for posting this and happy trails brother.